Let's take this problem one PC browser at a time. This one's easy. In Firefox, on the PC, select Tools (if you don't see menus at the top of the window, tap ALT), then Set Up Sync. Fill out the form, sticking to defaults when you're not sure. Then install Firefox for Android on your phone. 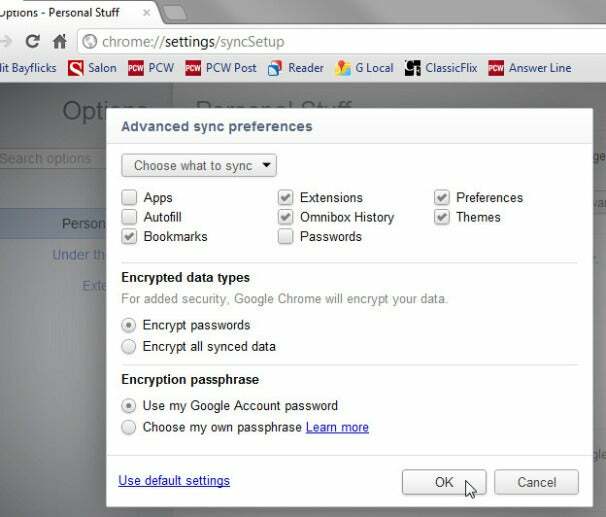 When you first launch your new browser, click Set Up Sync. You'll get a screen with three codes. On the PC, select Tools, then Options. Click the Sync tab. click Pair a Device and enter the codes. You'd think that one Google product would easily sync with another. But, alas, you'll need third-party software--and a Google account (such as Gmail). Click the tool icon in the upper-right corner and select Options. In the left pane, click Personal Stuff. In the "Sign in" section, make sure you're signed in as yourself. Click the Advanced… button and make your sync choices. You want Bookmarks checked. You may or may not want the others. On the phone, go to the Play Store (formerly called the Android Market) and download and install either ChromeMarks or ChromeMarksLite. Click here to decide which one you want. You should have no trouble setting it up. Your bookmarks won't show up in the browser. But when you click one in ChromeMarks, the page will open in your browser. The online service XMarks will sync your bookmarks across multiple browsers and platforms. On the PC side, you can install XMarks add-ins for various browsers. The basic XMarks service is free, but it doesn't support phones. For that, you'll need the shell out $12 a year for the Premium service. 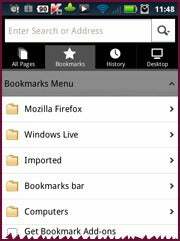 As with ChromeMarks, you use the XMarks app to find and select bookmarks, which then launch in your browser of choice.